Planning that summer getaway to the beach? If so, then you’ve come to the right place. Whether you’re jet setting off to an exotic island, taking a week-long vacay with the fam, or live right at the beach (lucky you! ), there are some items that you should never leave home without. 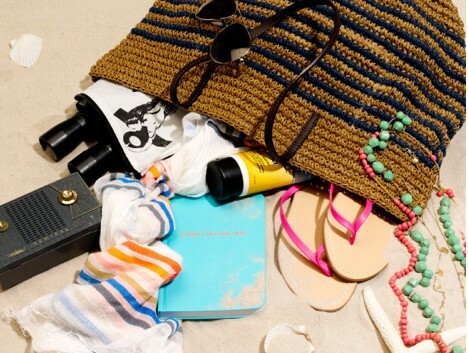 For the best possible beach experience, add these 13 items to your beach bag today! Grab your cutest bikini (in this case, a turquoise floral number trimmed with ruffles) and hit the waves! Don’t let the combination of the sun, sand and sea ruin your gorgeous hair. Invest in Fekkai’s ‘Marine Summer Hair’ cream to “hydrate parched summer locks” and prevent unwanted frizz. If you’re at the beach you have to protect your skin – use sunscreen! Shield your eyes and face from the sun with this ultra-chic straw hat! After a l-o-n-g semester of classes, odds are you’re behind on your favorite glossies and books. Catch up with the latest fashion trends or immerse yourself in one of Nicholas Sparks’ heart-wrenching novels. A day at the beach isn’t the same without your favorite summer playlist. Tuck away your iPod/iPhone in this nifty AM/FM speaker box to keep it safe from sand, sun and surf. Nothing says beach-ready like a red-and-white striped bag. Lined inside with houndstooth, this bag is spacious enough to hold all of your beach essentials. Toss your hair up into an effortless ponytail with one of these dent-free hair ties (when you’re not using them, they can be worn as a bracelet!). When it comes to sunglasses, I’m extremely picky. They have to be round, oversized, tinted and preferably edged with a black frame. That said, this pair of shades is perfect for me! Since everyone’s preferences vary, however, make sure to pick a pair that best complements your face shape. (Mango has some great options to choose from!). Keep your body nourished throughout the day with healthy snacks, and remember to drink plenty of water to stay hydrated. Also, regardless of what anyone says, you’re never too old for some Capri Sun! Whether you wear it, lay on it, or use it to dry off, a day at the beach is not complete without a stylish beach towel. A beach towel is a reflection of your personal style, so pick one that stands out like this vibrantly striped one from Lacoste. Prevent chapped lips by moisturizing them with one of Tarte’s natural lip sheers – they are vitamin-E enhanced and contain SPF 15. I swear by Havaianas flip-flops and can confirm that they are the comfiest sandals around (your feet really do bounce off the rubbery soles!). Keep your feet happy in this pair of grey and pink animal print flip-flops (or select one of the many other fun designs and colors). 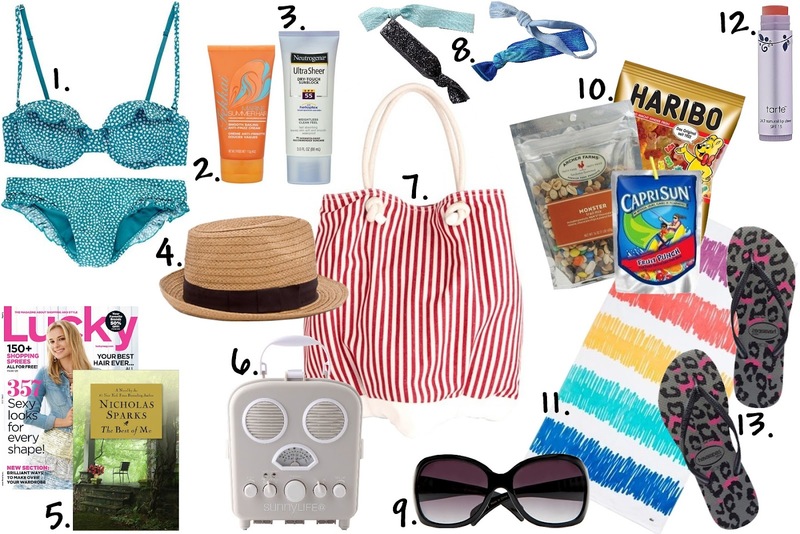 Did your must-have beach essentials make the list? Leave a comment to let us know what we missed!